While Tuesday’s total solar eclipse didn't cast a shadow over North America, NASA had live streamed it from 7 to 9 p.m. ET. The total eclipse took place from 8:38 to 8:42 p.m. ET. The moon blocked the sun in a "perfect" way for viewers to see the corona, NASA space physicist Dr. Yari Collado-Vega told NBC News. "In the corona, that is where most of the interesting things for space weather happen: solar flares, mass ejections and temperature changes from the surface," he said. The last total solar eclipse happened last year. This year, the sun eclipsed for anywhere from 90 seconds to four minutes, depending on where it had been viewed. The rare and awe-inspiring unfolded over parts of Indonesia and the Indian and Pacific Oceans, weather permitting. The full eclipse was visible to several million people within its narrow path including eclipse chasers who traveled from around the world for a chance to witness it. WHERE WAS THE ECLIPSE BE VISIBLE? The total eclipse was visible within a roughly 100-150 kilometer (62-93 mile) -wide path that began in the Indian Ocean and sliced across parts of Indonesia including Sumatra, Kalimantan and Sulawesi before ending in the northern Pacific Ocean. Indonesia's capital, Jakarta, was not within the eclipse path, but the Sumatran port city of Palembang with a population of more than 1.4 million was. Cloudy skies, however, can make the much anticipated event a disappointment. And there was a high chance of clouds because Indonesia is in its wet season. People in South Asia, East Asia and the north and east of Australia may have seen a partial eclipse. HOW LONG DID THE ECLIPSE LAST? The entire eclipse, which began with the first patch of darkness appearing on the edge of the sun, lasted about three hours. For the viewer, the exact duration of the total phase of the eclipse depended on their location along the path. The moments in which the sun was entirely obscured lasted between 90 seconds and 4 minutes. Palembang in Sumatra was the first major city to see the total eclipse, at about 7:20 a.m. local time. The position at which the total eclipse lasted the longest, 4 minutes and 9 seconds, was in the Pacific Ocean east of the Philippines. On land the durations were mostly between 1 and 3 minutes. WAS THE ECLIPSE SAFE TO LOOK AT? It is dangerous to look at the sun with the naked eye during a partial eclipse, the partial phases of a total eclipse and another type of eclipse called the annular eclipse, particularly using devices such as telescopes. Optometrist and eclipse chaser B. Ralph Chou, who helped develop international standards for filters, wrote that those coated with a fine layer of aluminum, chromium or silver such as the darkest welder's glass and filters made of aluminized polyester in the darkest shades are safe. The filters should be specifically designed for the binoculars and telescopes that they will be fitted to. Another safe but cumbersome and probably unsatisfying method of viewing is pinhole projection of the image onto a screen. Unsafe filters include color film, black-and-white film that contains no silver, photographic negatives with images, smoked glass and sunglasses even if multiple pairs are worn. During the spectacular moments of total eclipse it is safe to look at the sun with the naked eye. Authorities had been promoting the eclipse as a tourism event locally and internationally since 2014. Because of their rarity, total eclipses are a magnet for scientists and eclipse chasers. Overseas tour agencies chartered ships for groups who wanted to view the eclipse at sea and many land tours, which are the best for photography, had also been organized. Oklahoma-based Spears Travel said a group led by a former NASA scientist it had booked on a special Holland America Line cruise included people from Canada, the U.S., Britain, China and Iran. 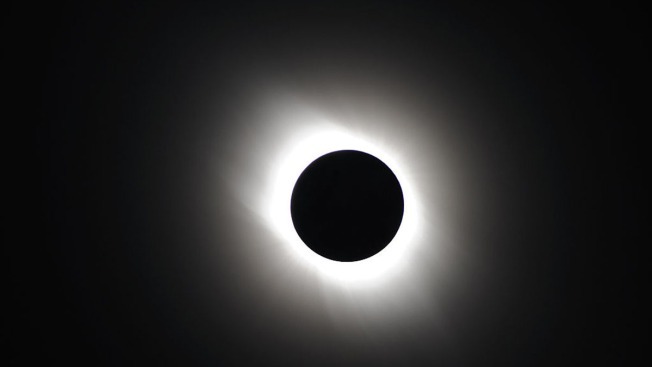 An eclipse festival was planned for Palu, the capital of Sulawesi province, and 11 cities in total were promoted as places where the total eclipse could be clearly viewed.